Summer is right around the corner, which means it’s time to enjoy some agua fresca! 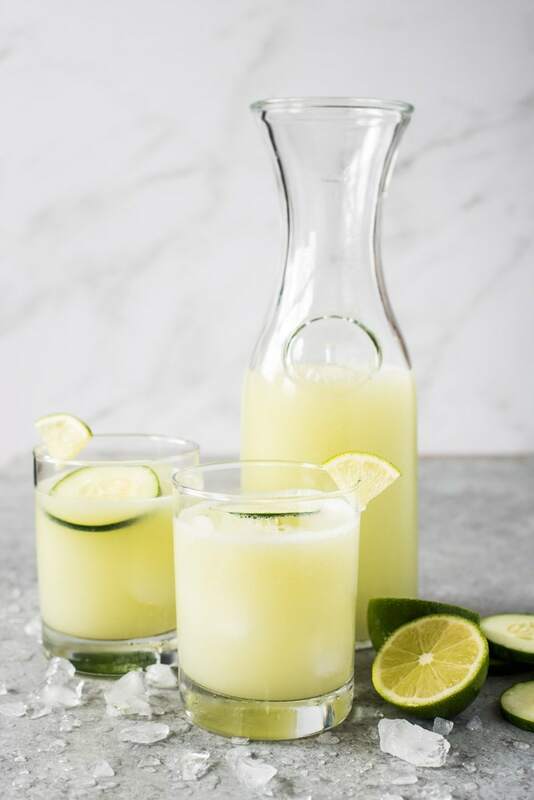 Made with refreshing cucumber, a spritz of lime juice, a touch of sugar and ice cold water, this cucumber agua fresca (also known as agua de pepino) is the perfect drink on a hot summer day. I have fond memories of drinking agua frescas as a kid at my church’s annual carnival. They had all sorts of flavors – melon (cantelope), sandia (watermelon), tamarindo (tamarind), horchata (almond and rice). One of my favorites has and always will be this cucumber flavor. Agua fresca, or “fresh water” in English, is a refreshing Mexican drink made from water and blended fruit, tea leaves, vegetables and sometimes rice. It’s lightly sweetened with sugar and often served over ice. I like to think of agua fresca as a mix between flavored water and the fruit juice you would find at your local grocery store – it’s made with real fruit and vegetables, but it’s very lightly sweetened and doesn’t give you that sugar rush that you often get from fruit juices. It’s literally the best of both worlds. 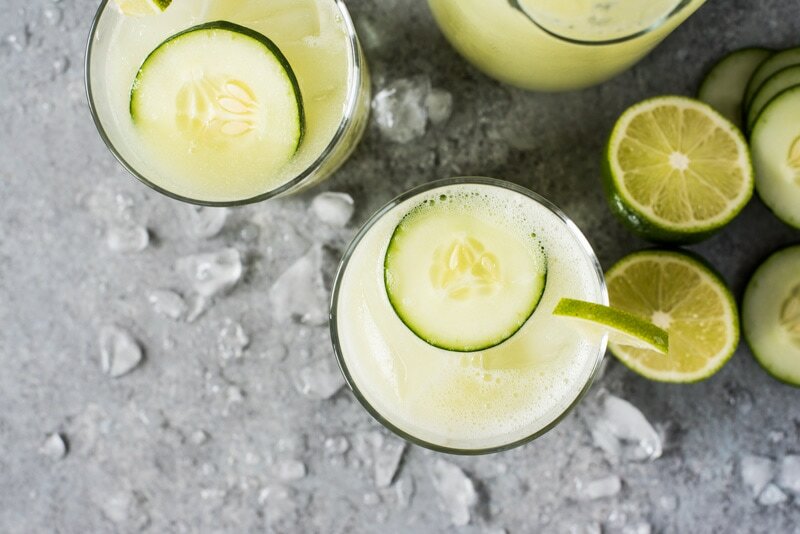 Making agua fresca at home, especially this cucumber flavor, is insanely easy. I’m almost embarrassed to call it a recipe! But if you’ve never made it before and are looking for a satisfyingly cool sip of lightly sweetened cucumber water, here’s how to make it. Add 4 cups of water, 3 peeled cucumbers, 1/4 cup of lime juice and 1/4 cup of sugar to a large blender. Serve over ice and enjoy! That’s all there is to it! Simple, easy and delicious. 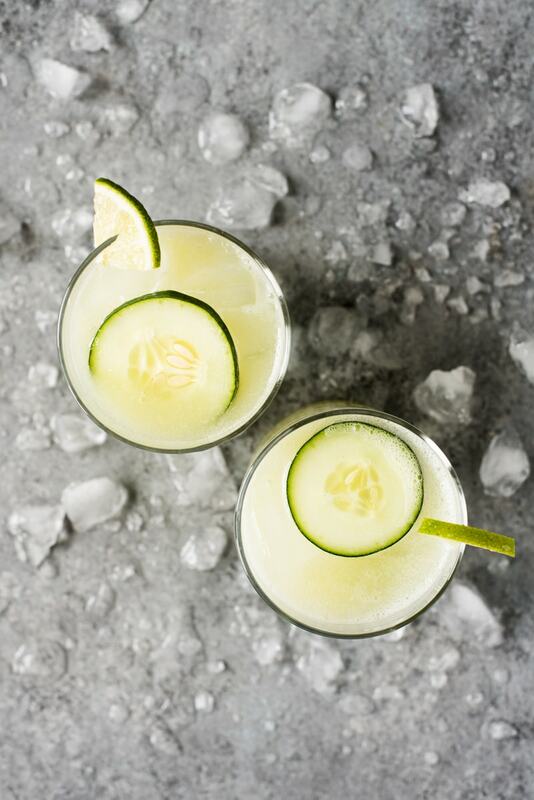 Like this cucumber agua fresca recipe? Try these other Mexican agua frescas! Serve agua fresca over ice. Did you make this recipe?Leave a comment below and tag @isabeleats on social media! This drink looks so refreshing and delicious! I'm Isabel and I love Mexican food. Join me in the kitchen for easy recipes with a Mexican twist! Learn more about me here. Many outgoing links on Isabel Eats are affiliate links. If you purchase a product after clicking an affiliate link, I may receive a small percentage of the sale for referring you, at no extra cost to you. Isabel Eats, LLC is a participant in the Amazon Services LLC Associates Program, an affiliate advertising program designed to provide a means for sites to earn advertising fees by advertising and linking to Amazon.com.